If you are a fan of all things fey then you are going to want to check out Pixie Wings from Pragmatic Play. This beautifully designed game is teeming with tiny details and lots to enjoy. Try it for yourself now at Rocket Slots! Pragmatic Play has ensured that attention has been given to every detail in this game no matter how small. Every single symbol is jam-packed with design and the entire game is a pure feast for the eyes. There are two distinct different levels of symbols in Pixie Wings. The lower worth symbols are the familiar faces of an A, K, Q, J, and 10; well-known to anyone who may have played a slot before. The higher paying symbols are represented by four beautiful pixies. There is a Thranduil-esque King dressed in yellow, a stately Queen in pink, a noble Prince in blue, and a sweet-faced Princess in green. The Wild is a beautiful incarnation of the game’s logo while the bonus scatter is a wonderful drawing of a tree. Pixie Wings is a wonderfully simple game to play. All the controls are to be found beneath the reels. Simply use the plus and minus keys to adjust your bet to a value you are happy with and you are good to go! You can use either the spin to manually whirl the reels or you can use the game’s extensive autoplay functions. Not only can you select a number of spins, you can also place some limits to ensure that you are in control at all times. The mandatory one is a loss limit but there are some others like a stop if the bonus game plays. 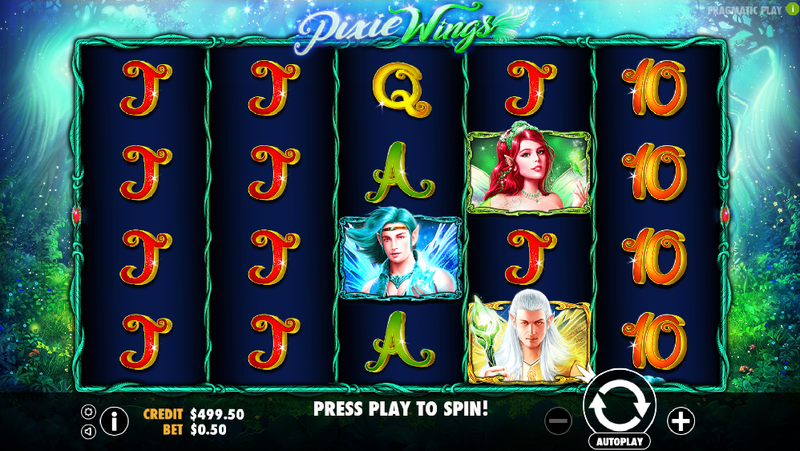 To land a win in Pixie Wings, you need the reels to give you a certain number of matching symbols along any of the game’s 50 paylines. The lower paying numbers need 3 symbols while the higher paying Pixies only need 2! The crowning jewel of Pixie Wings by far is the free spins feature. All you need to trigger it is 3 of the bonus scatters! You will be taken to a new screen where you will have one of five choices to make. During the free spins, one of the symbols will be super-stacked and you can choose which one. You can choose the King for 5 free spins, the Queen for 7, the Prince for 9, or the Princess for 11. The fifth option is a mystery which will select any of the Pixies or the Wild and a random number of spins from 3 to 12. Having the super-stacked reels makes it really easy for you to grab a big win. Do you dare choose the higher valued Pixie with the lower spins or do you see what the mystery will bring you? The choice is up to you! The super-stacked reels are also present in the base game. They are a great tool you can use to your fullest advantage to ensure you grab yourself a fantastic win! Overall, we loved our time with Pixie Wings. It is a stunning game with lots of potential for you to win big. Try it for yourself today!